In Youth Hockey, 'Checking' Ups Risk Of Brain Injury Body checking -- or using your body to block another player -- is legal in professional hockey. But a new study finds it leads to higher rates of brain injury among youth players. Now the governing body for U.S. ice hockey is debating whether the game needs age restrictions for checking. 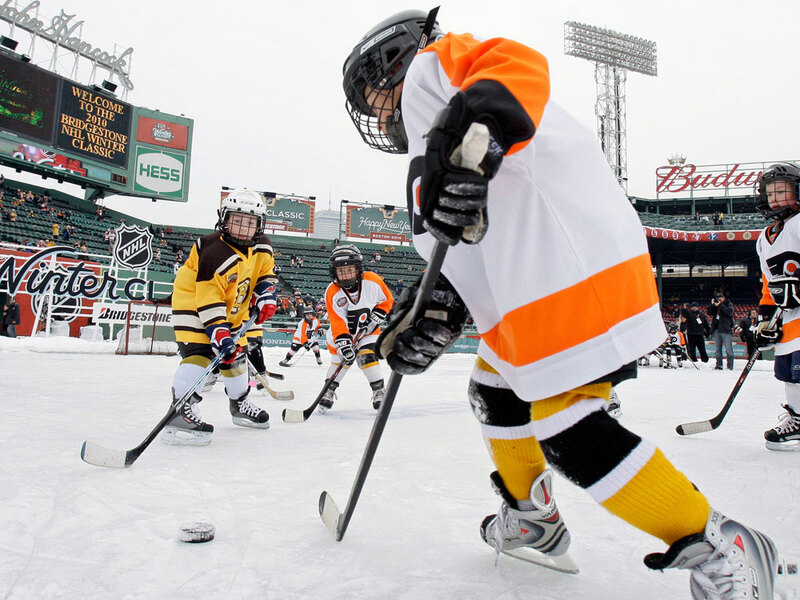 Youth teams play on an auxiliary outdoor rink before the 2010 New Year's Day Winter Classic NHL hockey game. New research shows that young players in leagues that allow checking are much more likely to suffer concussions and serious injuries than kids who play in leagues that ban it. All contact sports introduce the risk of injury. But researchers say there's one move in hockey that can be mighty dangerous for young players: the body check. A new study finds 11-year-olds who played in a league that allows checking -- using your body to block another player -- are more than three times as likely to suffer concussions and serious injuries compared with kids who played in a league that bans checking. Carolyn Emery of the University of Calgary, one of the researchers who conducted the study, said that if body checking were banned in her province -- Alberta, Canada -- "we'd expect to see 1,000 fewer injuries and about 400 fewer concussions." In the study, which was published in the Journal of the American Medical Association, Emery compared injury rates among hockey players in Alberta to those in Quebec, where checking is banned. Typically many hockey leagues in the United States and Canada introduce checking at age 11. "But I think these findings are strong evidence to support the notion that perhaps the age at which body checking is introduced should be reconsidered," says Emery. The American Academy of Pediatrics agrees. The group recommends limiting the practice of checking for all players younger than 15. The policy was drafted in 2007 after a report that concluded body checking accounts for 86 percent of all injuries that occurred during games played by 9- to 15-year-olds. Top hockey leaders didn't seem to give much credence to the AAP recommendation. "We thought there wasn't enough data there," says Kevin McLaughlin, senior director of hockey development for USA Hockey, the national governing body for youth and adult hockey leagues that establishes the play rules. McLaughlin says the new study published in JAMA adds more to the debate. "I think this new information will definitely play a factor with our board of directors and our district representatives." The study has generated a lot of discussion about the right age to introduce body checking. There's also recognition that body size makes a difference. Studies show that smaller, lighter kids are at significantly higher risk than bigger players. In order to understand the power of a body check, look no farther than NHL replays. During a playoff game several years ago, Philadelphia Flyers player R.J. Umberger was slammed by Buffalo Sabres player Brian Campbell. "Campbell just destroyed Umberger," one of the announcers boomed. In the stadium, the fans went wild, and on the ice a brawl ensued. Umberger looked up from the ice with a woozy look. "It's a dramatic hit, and he looks like he got a concussion," explains concussion prevention researcher Barry Willer of the University of Buffalo, after watching the incident on YouTube. But Willer says despite these dramatic plays, the body check is integral to the sport. During competitive collegiate and professional games there can be dozens of body checks where no one gets hurt. But this takes skill. And it takes young players time to develop the skill. "So when should the youngster learn to body check -- and more importantly to take a check?" asks Willer. "That's the controversial issue." Willer says he's not convinced that waiting to the age of 15 to introduce full body checking is the best solution. He explains there's a steep learning curve. And he says no matter when the move is introduced, injury rates will probably go up as players adjust to using it. Willer's advice is to limit checking in all recreational leagues, and leave these intentional slams to the competitive players who are aiming to make a collegiate or professional career out of it. The earliest that USA Hockey would consider any policy changes is next summer. In the interim, the group says it will to continue to focus on educating coaches on the best ways to help players develop proper checking skills and prevent injuries. "Our No. 1 priority is the safety of the youth athlete" says McLaughlin. "We don't want anyone getting hurt playing the game."